The Jungle 7s are some of the most unusual animals that humankind has ever come across. Click here to play! Bearing an incredible resemblance to the number 7, the Jungle 7s come in 2 varieties: silver and gold. They are known to be attracted to shiny objects and especially gold coins. Locals think them to be incredibly lucky, as following a group of three Jungle 7s back to their nests is often profitable, given their tendency to horde gold coins. The silver 7s are more submissive, and they tend to build small nests of coins. This is in contrast to the gold 7s, who are very aggressive in their coin hunting, often creating massive nests of gold. Some suspect the Jungle 7s even have their own religion, as temple-like structures made of gold are often found near communities of Jungle 7s. The creatures have a limited diet of red cherries and rare insects which have markings that look like the word BAR written on them up to 3 times. After they've eaten their fill, the Jungle 7s often have a much easier time finding more gold for their homes, so these BAR insects may have some kind of chemical in them that increases the fortunes of Jungle 7s. We need more help in researching these fascinating creatures. 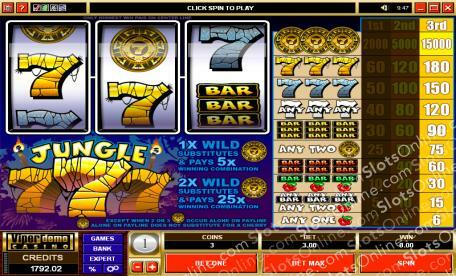 Their natural habitat is the online casino, especially in the classic 3-reel slots section. Play with the Jungle 7s for a while and observe their behavior. You never know if they will lead you to their horde of gold! The Gold Coin symbol is wild in this slots game, and it also increases the payout of winning combinations it substitutes for. When 1 substitutes, it increases the payout by 5 times. When 2 substitute, the payout is increased by 25 times. A single Gold Coin does not substitute for a single cherry symbol.